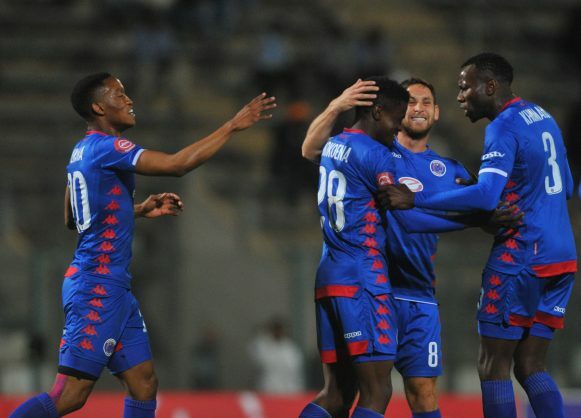 SuperSport United continued their good start to their Premiership campaign after edging Chippa United 2-1 at the Lucas Moripe Stadium on Wednesday night. New Chippa United coach Eric Tinkler came up against his former employers for the first time in what proved to be an unsuccessful outing. A cagey start was the perfect foil for what proved to be an all-action encounter with Kurt Lentjies testing Ronwen Williams for the visitors, before James Keene missed a chance to send the hosts in front with his header drifting wide. Impressive young midfielder Teboho Mokoena then put SuperSport United in front with a clinical finish in the 15th minute. Lentjies was quick to act and make up for his earlier miss as he drew Chippa level in the 26th minute. The home side regained control of proceedings which allowed Evans Rusike to restore the advantage as he stroked home shortly before the break. Already beaten twice in the first half, Chippa goalkeeper Daniel Akpeyi was then tested on more than one occasion by Aubrey Modiba but the Nigerian shot-stopper did enough to keep his side within sight of a point. Although attempts on his opposite number’s goal were few and far between. With both coaches making a number of substitutions, the match’s tempo stalled as the Chilli Boys starting to chase the game. The game opened up and it was experienced midfielder Dean Furman who came closest to finding the second half’s first goal but his effort in the 76th minute sailed over the goals. Tinkler’s men failed to find an opening as SuperSport shut up shop and sent their former mentor back to Port Elizabeth without a point to show for their effort.